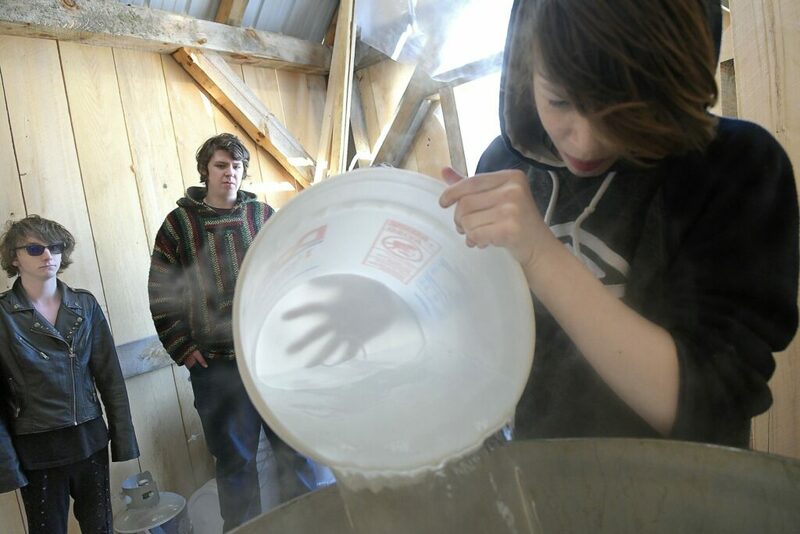 Boiling sap gives Maranacook Community High School Alternative Education students a chance to learn a craft that stretches back through decades of Maine history. READFIELD — Nikolas Grant has the kind of kinetic energy and agility that has him climbing walls. But on Monday, that urge was tempered by a project Grant and his classmates in the Maranacook Community High School Alternative Education program are working on on the grounds of the school. As part of a timeless rite of spring across the northeastern United States, the students have tapped local maple trees and collected the sap; now they are boiling it down into maple syrup in two out-sized kettles set on stands over propane-fueled flames. Grant, 14, was monitoring the rate of boiling in the kettles, and was tracking the gradual increase in heat of the boiling sap with a candy thermometer. The optimal temperature is 219 degrees, but the sap had reached only 175 degrees by mid-morning. Brandin Jasper, 15, was also on keeping an eye out. While he has never boiled sap himself before, he has a cousin who has, and he’s familiar with the process. What he liked especially about this project is that it was getting him out of the classroom. “It’s nice to get out of class and get fresh air,” he said. The students in the Alternative Education program started about a month ago, tapping trees and setting buckets to collect the sap, then hauling the sap to the makeshift evaporators. When the buckets are full, Foster said, they’re pretty heavy, and he’s carried quite a few. “It’s a lot more work than I thought it would be,” he said. Teachers Kelsea Trefethen and Brad Blasius have been supervising the project. While it’s Trefethen’s first year, Blasius has been making syrup for several years, at home and at the school. Over that time, he said, the process has improved to using tubing and covered buckets to keep out debris and water, making the process of boiling sap more efficient and cleaner. They would also like to acquire a more efficient evaporator to shorten the process of making syrup. “This is a very long process with the equipment we have,” he said. 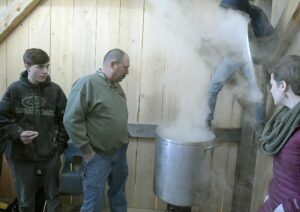 Trefethen said the boiling will probably be finished for the season by Wednesday, and the seven students who are involved in the project will be off to the next thing. While the students are applying science, they won’t have to produce anything other than the syrup this year to show what they learned. Competing with the dull roar of the propane flames was the flapping of the plastic sheeting drawn across the open doorway of the shack, which was the only protection from Monday’s stiff breeze. By the time the next sugaring season rolls around, there may be a permanent fix for that. Members of the Industrial Arts program had stopped by briefly in the morning to look at the shack’s construction, which was built in the Alternative Education program. Nathan Delmar, who is now a sophomore in college, took on the shack as a senior project. At the other end of the high school, in the industrial arts shop, Nate Foster, 14, was forging a hinge for a door for the shack. He was about to cut a notch in the knuckle of a hinge on Monday. Once that’s done, it can interlock with a second piece with a knuckle to hold the pin that will allow the door to swing open. Foster has a forge at home, where he has been learning for a few years how to work with metal, and where he has made some knives. To design his hinge, he said he watched a couple of YouTube videos. 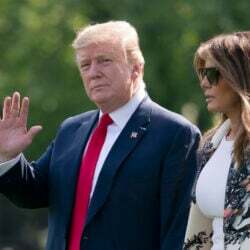 He’s already spent “a bunch” of hours, and he expects to spend “a bunch more” until the project is done. “I’m only down here about an hour a day,” Foster said. While the sugaring season will continue across Maine and the northeast, Blasius said the school will wrap up its project in the next week or so. The final part of the boiling will take place inside the school, where conditions are more controllable. When syrup is achieved, it will be bottled in mason jars and used for a pancake breakfast at the school. In the end, it all boils down to this: Is it worth the effort?